Whether it's legitimate or not, a newly revealed front panel claimed to be for Apple's next-generation iPhone appears to show a part for a 5.1-inch display with a screen ratio of 16 to 9. Measurement provided to AppleInsider by Steve of East Coast Pixels. A photo revealed earlier Tuesday purports to show an "iPhone 6" front panel next to the 4-inch display of an iPhone 5s. AppleInsider reader Steven from East Coast Pixels —makers of the iOS photo editing app PhotoToaster —took a closer look at the alleged Apple part in an effort to determine its dimensions. 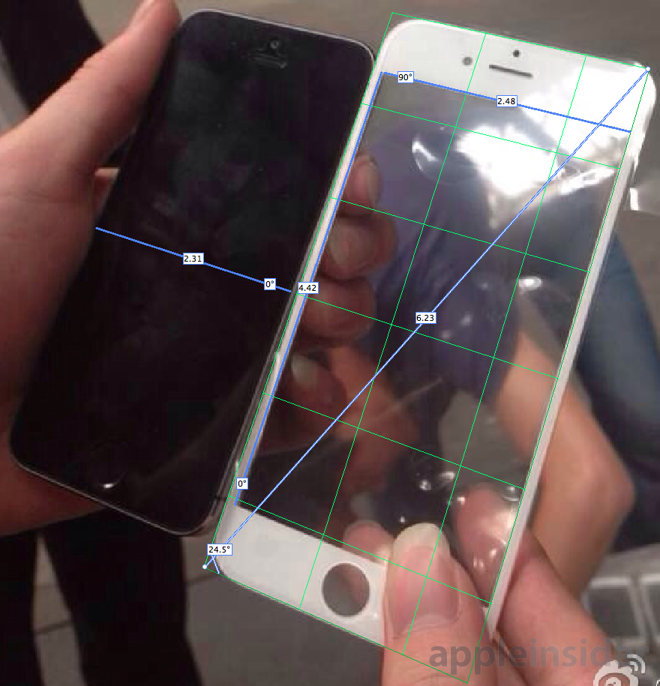 Using the iPhone 5s on the left as a comparison, the part appears to show an iPhone display with a 5.07-inch diagonal measurement, or nearly 5.1 inches. It also has a 16-to-9 aspect ratio, which would be identical to the ratio found on the current iPhone 4-inch display. Apple is likely to keep a consistent aspect ratio in order to make the transition to a larger screen size as easy as possible for developers. When combined with a properly chosen display resolution, apps would be able to scale with little or no modification. However, an iPhone screen size just shy of 5.1 inches does not align with recent rumored display sizes for Apple's next-generation handset. Well-connected analyst Ming-Chi Kuo of KGI Securities said in a research note last week that he believes Apple's 2014 iPhone models will come in two screen sizes of 4.7 inches and 5.5 inches. "iPhone 6" mockup via Ciccarese Design. A 5.07-inch iPhone display, if the leak is in fact accurate, would essentially split the difference between those two rumored screen sizes. 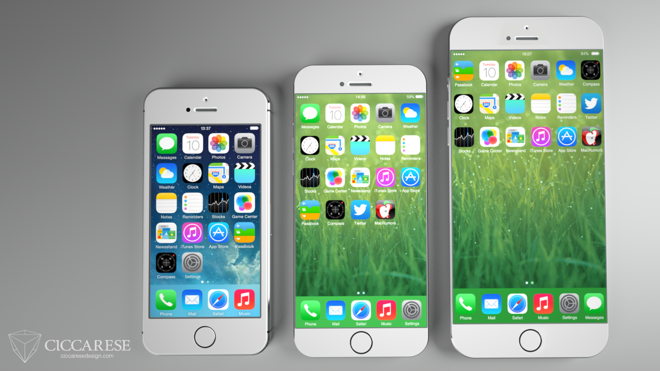 It would also come in more than a full inch larger than the current display found on the iPhone 5s and iPhone 5c. There is a question as to whether an iPhone with a 5.1-inch display would continue to allow for one-handed use. To date, Apple has changed the screen size on the iPhone only once, jumping from a 3.5-inch to a 4-inch display, citing that it couldn't go any larger without compromising the ability to use the device with just one hand. But in recent years, smartphone displays have trended to the larger size, with consumers embracing handsets regardless of their ease of one-handed operation. According to Kuo, Apple apparently plans to include a bezel-less design with the rumored 4.7-inch model to continue to allow one-handed use, while the 5.5-inch model will appeal to those consumers who are not concerned about operating their phone with one hand. The leaked part displayed on Tuesday, however, does not include a bezel-less design.